Home > Books, CDs & DVDs > Robert Simmons: "Stones of The New Consciousness"
In Stones of the New Consciousness, author Robert Simmons invites the reader to journey inward to the domain of the Stone Beings. There we learn of the astonishing potentials for spiritual healing, mystic awakening and the birth of a new planetary co-creating consciousness through relating with the stones and their spiritual qualities. There we meet the Soul of the World, the feminine spirit of World Wisdom sometimes called Sophia. We discover the all-pervading harmony of the living Earth, and the emanations of Wisdom that are the Stones. We awaken to our destiny of freeing the spiritual qualities of the stones, allowing them to incarnate in the world through partnership with us. Stones of the New Consciousness contains in-depth information on the sixty-two most important stones for awakening the Light Body and entering the path of our unfolding destiny. 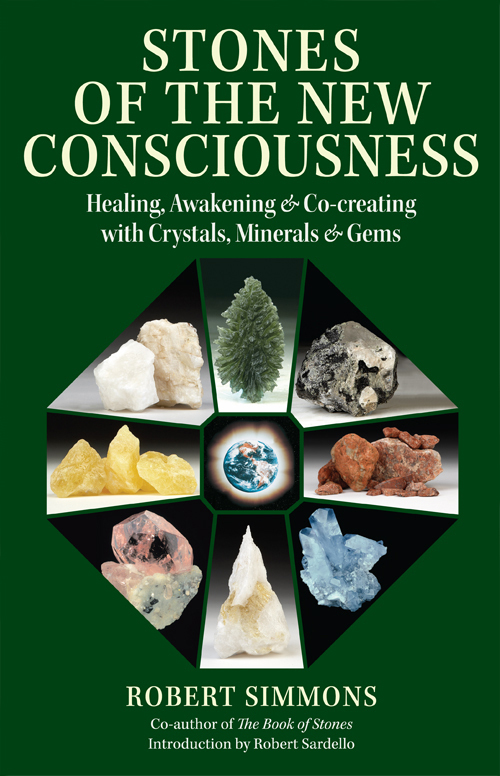 It offers chapters on Healing with the Stones, Crystal Meditations, Stone Elixirs, Crystal Tools and Jewelry, discovering the Liquid Crystal Body Matrix and Awakening the Body of Light. You’ll also discover the secrets of the mysterious Crop Circle Stones, the connection of Quartz to the origin of life, the DNA key to the spiritual World of Light, the Divine pattern of the Human Light Body, and how our Ascension is linked with the Earth’s. We also explore the astonishing tale of the Azez, angelic stewards of the Nameless Light, and their mission to enlist our aid in transforming Earth into a Planet of Light. We travel to the inner realm of the Great Central Sun, holographic core of Creation. We learn of the connections of Moldavite and Azeztulite to the Stone of the Holy Grail and the Philosopher’s Stone. We are invited to initiation into the mysteries of spiritual ascension, and the mystical wedding of Heaven and Earth, which can occur in our own bodies, working with Rosophia and Azeztulite. Many of the minerals discussed in Stones and the New Consciousness are newly found materials not mentioned in The Book of Stones. All of them are met in new ways, through meditations narrated by the author, and through attunement to the stones’ own voices. If you love crystals, gems and minerals and you want to find a new and deeper understanding of the potentials locked within them, and within yourself, Stones of the New Consciousness can open the door.